Ola! Do you ever realize how many things you keep in your suitcase just because you love these items to death and can’t bear to let them go, even though they aren’t mesh and face it………just not new? Since I have been cleaning out my inventory (from 120,000 down to 80,000) and I have found lost loves, like these fabulous Sheepskin Mittens from League in every color, can’t live without! Or this pretty Voluminous Scarf/Hat set from Maitreya that I bought a billion years ago with hair lol <333 I’m also wearing a pretty little set of Flamel Boots from The Secret Store from last season?! Throw in an amazing mesh and material Anais style from Mina <333, the newest LeLutka Skin Applier Luna from League, and a fantastically cute mesh Party Sweater and Jean combo from Bela over at *TuttiFrutti* and as a topper, a pose with Lollipop from Label Motion out for this months round of My Attic at the Deck until tomorrow only……….and you have a fabuleux combination yes? I am keeping a folder for all my older items that I love too much to toss, even though they are well-worn but still loved. Do you do the same? Or am I just a sl hoarder?! hehe hmmmm I wonder!! 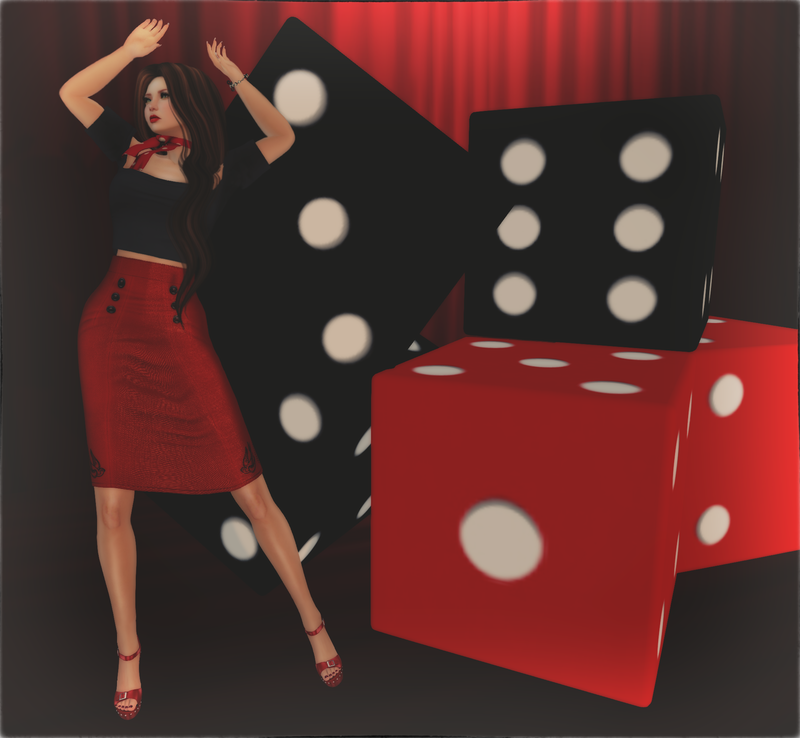 You Got To Know When To Hold ’em…..
Ola! One more for My Attic at the Deck which closes tonight at midnight slt. Ugh I just absolutely love Love LOVE this Rock-a-bye Baby high-waisted skirt from Girl Thursday, with a few colours to choose from and the details on the bottom of this fantastic skirt should tempt you! Oh and the wonderful ‘I Feel Lucky Dice’ with included 8 poses from W.Winx & Flair is something you want!! So get on over there pronto as these amazing deals are gone when the clock strikes midnight! Ola! Oh my goodness I am all rush rush as I simply have to show you what you will be missing if you don’t get over to My Attic at the Deck before midnight tonight! Ok well I am sure this amazing little ensemble from the beautiful Bela over at *TuttiFrutti* will be available in store soon, but the price at My Attic cannot be beat at 95L a pop yes! Go go go! Then swing by the newest round of The Liaison Collaborative for the wonderful Entwined Bella Updo, Cae Wanderlust Bracelet, Izzie’s Weekender bags and of course the Road Less Traveled Poses from elephante and the fantastic What Next Daybed collection you see here! Of course everything comes in many different colour versions to pick from yay!! Body: SLink ~ Physique Mesh Body V2.3. Ola, My Attic at the Deck is tempting you with a round of Temptation themed items all for 95L a pop! *TuttiFrutti* has this positively groovin mesh Knit Top and Uptown Funk Flare Jeans in many different colours and textures. If you are anything like me and in love with vintage/retro clothes you will be hard pressed picking which to buy………so I suggest getting all of them. Also at My Attic is the beautiful classic mesh/material Linda style from Mina, and O M G this style is seriously a must have! Nab each colour pack for only 95L and get this gorgeous style in materials or non with a selection of sizes to fit your boobage 😉 Along with a few of my favourite things I bring you a very boho Friday! I hopped over to Forest Feast to run barefoot in the flowers, what’s better than an old 60’s movie title with a little boho and flower power to go with?! I am off for a slice of real life, being my day off I must combine the two 🙂 I hope you enjoy the start to your weekend and I will definitely…..
Never Wear Your Heels On the Ice & Snow……. no matter how fabulous they are……..or you end up on your tush! Ola! Tonight I bring you a wonderful new outfit consisting of newness from Mina Hair with the mesh and materials Natasja, and Pixel Mode Lighted Trees from this months round of The Liaison Collaborative. TuttiFrutti has this amazing mesh Millionaire Glam Sweater & Legging combo at My Attic at the Deck. Then there are these absolutely yummy mesh Rochee Ankle Boots from Baiastice out at FaMESHed which should be closing very soon so hurry! Ola! Hope everyone is enjoying the last bit of fall…..I know I am! I cannot believe way up here in Alberta we have not had snow yet!! Something is really wrong if we don’t see it before Halloween, but hey I’m not knocking it in any way hehe! Stop by Cirque de Seraphim to nab this perfectly cute as a button Cozy Mesh Sweater and Dolly Pant combo from sweet Bela over at TuttiFrutti. Oh and Miseria has this adorkable Apple Purse out for Chapter Four. Good evening, I wanted to get something out before I fall into bed from exhaustion……it has been a long day, or in my case a very long month. I look at my computer most nights and almost want to cry from absolutely no use, since joining the working world again with very long hours, I havent been up to posting in my usual manner and I do so apologize to all the wonderful designers that share their amazing designs with me. I am wearing a fabulous little outfit made by Bela from TuttiFrutti, the Ivy Mesh Sweater is available in Stripes as well as solids. The Ivy Mesh Skirt is available in some wonderful shades as well. I am also wearing some beautiful New Nail Appliers from Flair and these crazy gorgeous Elation Platform Heels from L.Warwick…..so yummy. 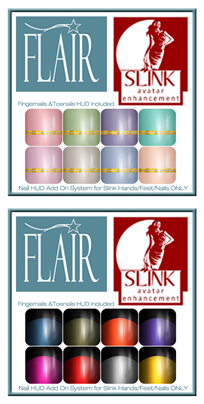 All available at My Attic at the Deck where there are some amazing new deals out for 95L each, oh and the Flair Nails are two sets for 95L! Don’t miss out My Attic at the Deck closes tomorrow at midnight slt time so get the goodies while you can!